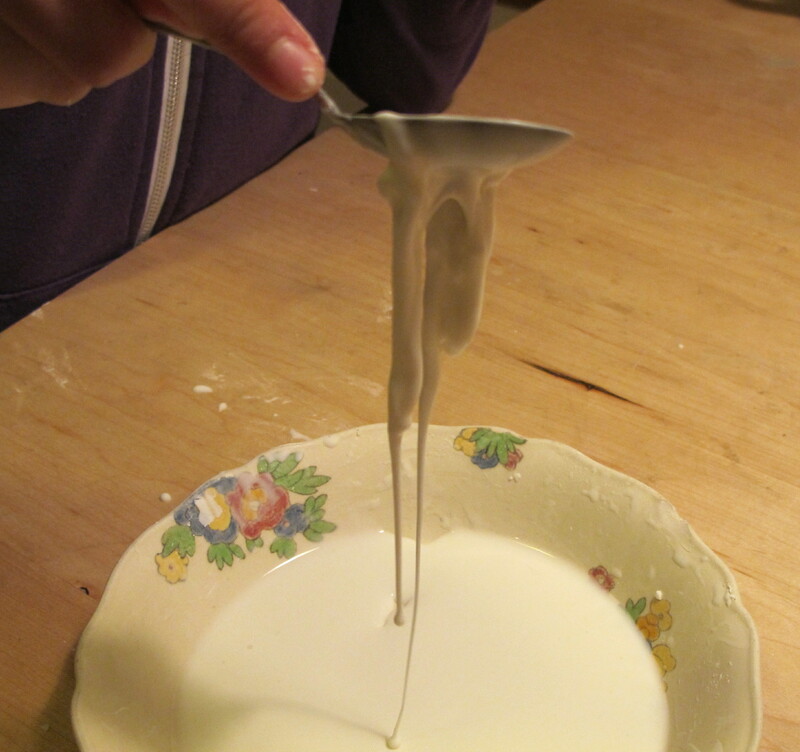 Make oobleck, a material that behaves both like a liquid and a solid, for very interesting experimentation. Add the water to the cornstarch in the bowl. Adjust if necessary by adding very little water or cornstarch, until it feels like a liquid when you're mixing it slowly, but can be scooped up if you move fast. It will not be powdery and feels hard when you tap on it. Invite students to play around with the oobleck - it acts very strangely! Tap a spoon on it, then rest the spoon on the surface - it will slowly sink. Rest your fingers on the surface of the oobleck. Let them sink down to the bottom of the bowl. Then try to pull them out fast. What happens? Take a blob and roll it between your hands to make a ball. Then stop rolling. The oobleck will trickle away between your fingers. Oobleck is tiny particles of cornstarch distributed in water. Cornstarch is a chain of sugar molecules (a polymer) called amylopectin. This kind of mixture, with tiny particles of one substance mixed into another, is called a colloid. In this case, solid particles are mixed into a liquid. 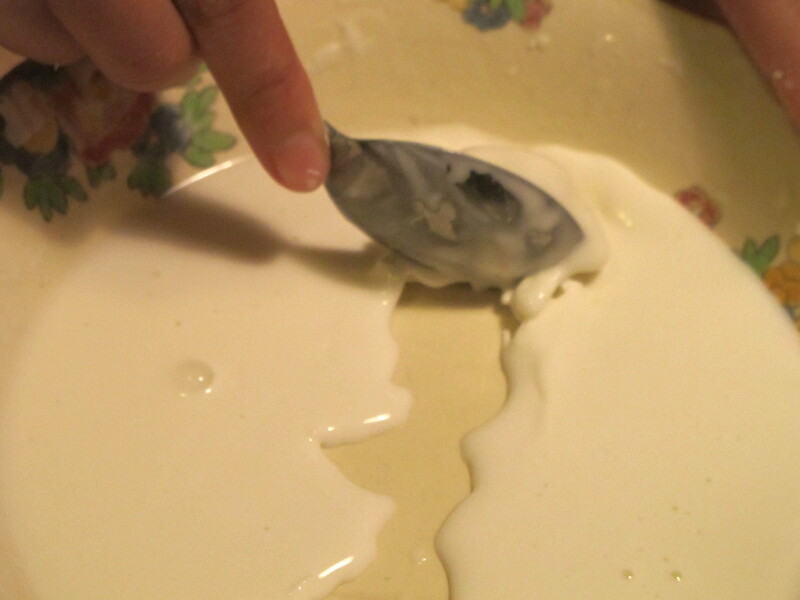 To separate this mixture the water can be evaporated away to leave the cornstarch - this will happen quickly if the oobleck falls as drops on a surface. Water and other liquids have certain properties and behave like many familiar fluids - if you stir them they move out of the way quickly. Their viscosity is always the same. 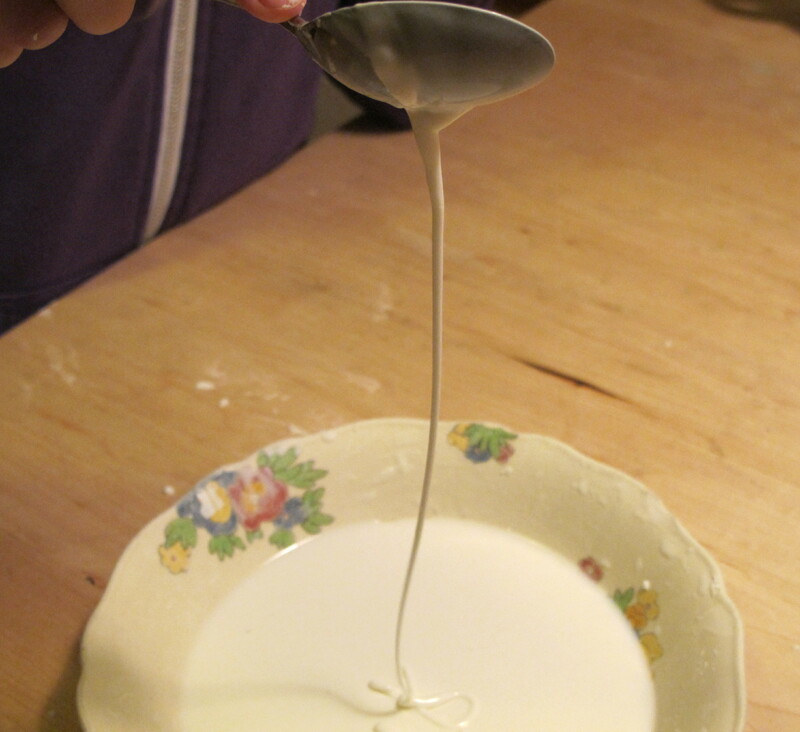 Oobleck doesn't act like these - its viscosity changes, depending on the forces on it. Something that behaves in this way and changes viscosity is called a non-Newtonian fluid. Quicksand is also a non-Newtonian fluid. If you ever find yourself sinking in a pool of quicksand (or a vat of cornstarch and water), try swimming toward the shore very slowly. The slower you move, the less the quicksand or cornstarch will resist your movement. Why does ooblek behave in this way? If moved slowly, the particles have water between them which allows them to slide past each other. But if moved quickly, the water is squeezed out from between the particles and the friction between them increases a lot, so they can't move past each other.